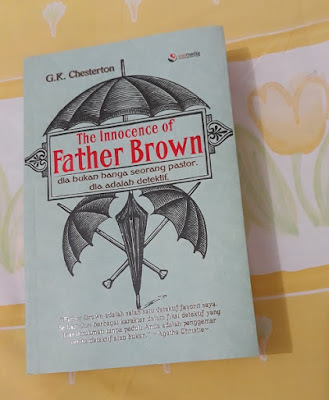 Father Brown is a petit priest with innocent look and black umbrella, whose long experience with men provided him a better understanding of human's passions and characters. That, and his special gift of analysis and observation, has molded Father Brown to a sharp detective. Yes, Father Brown is a pastor and a detective, and this is a detective stories collection. I am certain that Father Brown detective stories were Agatha Christie's main inspiration for her Poirot’s. First of all, his method of combining human psychology with sharp analysis and deductive. Secondly, his sidekick's name, M. Hercule Flambeu, which was very similar to Christie's legendary Hercule Poirot. The Innocence of Father Brown composed of twelve detective stories. In four earliest cases, Flambeau was the notorious and elusive criminal who has puzzled the police. It was Father Brown who solved those cases, and at the same time converted Flambeau. He retired from his criminal career, and eventually became private investigator, who sometimes assisted Father Brown as his sidekick. I took notes of the twelve cases, each is unique and interesting. The Blue Cross, the introduction story, is a jewel theft. Father Brown was the victim, Flambeau the thief. Chief Valentin of Paris police force was trailing Flambeau, though at the end became only a spectator when Father Brown unfolded the mystery. The Queer Feet is a simple theft story which also criticized snob rich men who consider themselves center of universe, and at the same time treat their servants as their inferior. It also served as the turning point of Flambeau's criminal career. The Flying Stars is Flambeau's last crime. It's a classic theft case which involved English dramatic pantomime, where people dressed as Harlequin, Columbine, and the Clown. Then, while the audience was having fun, three diamonds changed hands. The Invisible Man is a murder without a corpse. It's my favorite. Not only that it's a perfect crime, but also because it involved an interesting social study of how we treat people. The Honor of Israel Gow is the perfect Halloween reading in this stories collection. It's queer and gothic, taking place in old castle in Scotland, and involving grave digging and skull. The Wrong Shape can be said the predecessor of Christie's The Murder of Roger Ackroyd. The similarity is uncanny, especially the twist. And the way Father Brown solved the mystery by identifying the wrong shape of a sheet of paper was really Poirot-ish. The Sins of Prince Saradine is cold blooded revenge-murder story. Another plot twist, and a double crime—the “killing two birds with one stone” stuff. The Hammer of God served as warning for us to be humble, and not to act God. For common eyes, there was a touch of supernatural power in this death case. But Father Brown proved the opposite. The Act of Apollo is another seemingly-supernatural case. This time involved a fanatic sect and its 'blind' worshipper. It's the most simple but ruthless-cold-blooded murder I have ever read. The Sign of the Broken Sword is the most unique case. Actually it's not even a case, because Brown and Flambeau only analyzed the history of a legendary general who died in war, and was always identified with a broken sword. Why a broken sword? This question then led to a surprising conclusion. The Three Tools of Death is murder case with too many weapons. And as usual, something out of place is what interest Father Brown, a starting point to solve the case. This is my first Chesterton, and I would read more from him. The Man Who Was Thursday has been in my radar for some time. Father Brown might not be my favorite detective stories—at times the story is too queer for my taste—but it is quite entertaining if you feel like reading some fast-paced stories. Great review, makes me want to pick this up soon! Hope you enjoy The Man Who Was Thursday. It's become one of my favorites, but it took me 2-3 readings to understand the ending (first time I was like, what?! ).